Sana’a – As famine and cholera threaten to engulf Yemen in a vast humanitarian crisis, William Lacy Swing, Director General of the UN Migration Agency, on a visit to the country today (02/10), urged authorities to permit an immediate expansion of humanitarian access in order to save lives. “There is a veneer of normalcy in Sana’a with people thronging busy streets. This disguises the deep crisis that Yemenis are facing. Already 80 per cent of the population – 21 million people – are in desperate need of aid as a result of years of armed conflict, which regularly sees clashes and aerial bombings of urban areas. These 21 million vulnerable Yemenis (along with tens of thousands of migrants passing through the country) do not know where their next meal is coming from. Basic sanitation has broken down across much of the country and millions are without clean water,” said DG Swing. There have been over 2,000 deaths from the cholera outbreak since October 2016. While it can be deadly within hours, if left untreated, it is easily preventable through basic hygiene. The country’s healthcare and sanitation services are facing complete breakdown. So far, some 750,000 Yemenis have been hit by cholera (up from 276,000 last July) and more than 5,000 additional people are being infected every day. In addition, more than 3 million of Yemeni children under the age of 5 are at risk of severe acute malnutrition as an ever-present risk of famine looms larger. “The internecine conflict, which has convulsed Yemen for over two years already, shows no sign of being resolved. It has displaced more than 3 million people from their homes, putting them and their children at grave risk. Of specific concern to IOM is the tragedy that continues to befall many of the 6,000 migrants who continue to enter the country each month. They come in the hope that they can make their way through Yemen to the Gulf countries to find work,” stated DG Swing. “Few realize the grave dangers they are likely to face along the route, like exploitation and other abuse. Many are abducted by criminal gangs upon landing in Yemen. A common technique is to call the migrant’s family while allowing burning plastic from an empty water bottle drip on a migrant’s skin causing burns and excruciating pain. Families usually pay up quickly and the migrants continue their journey often to be extorted repeatedly by different gangs before reaching their destination,” DG Swing added. 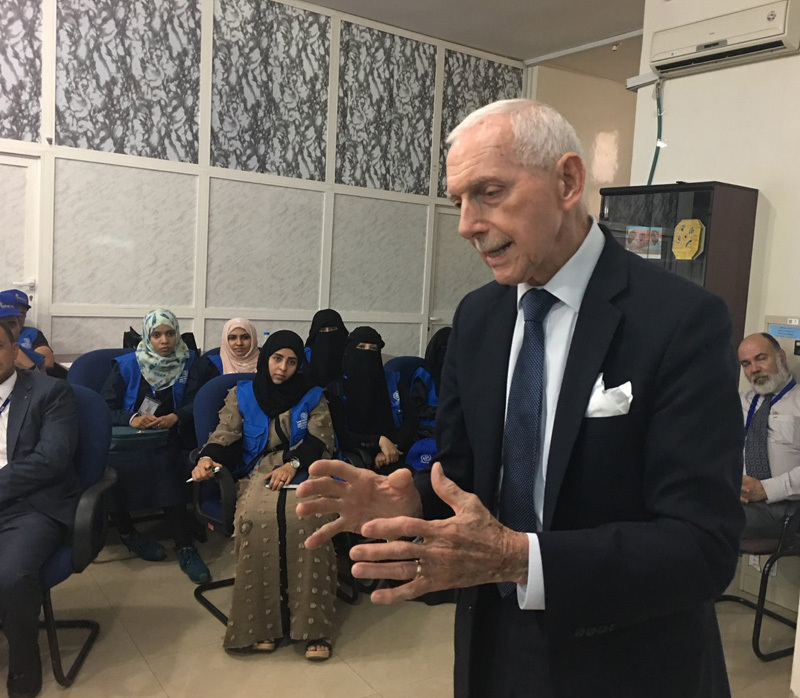 “For Yemenis and migrants, the protracted conflict has become an endless nightmare,” DG Swing stated, while also noting that in meetings with the authorities he has prioritized improved humanitarian access. He has also met displaced people to discuss their needs, as well as migrants. IOM, the UN Migration Agency has a well-established presence in Yemen with 603 staff across all of the country’s 23 Governorates. Working with UN and other humanitarian partners including many local groups IOM delivers humanitarian aid and tracks the movement and needs of displaced people. “More than two years of brutal conflict has turned this society upside down leaving a trail of needless devastation in its wake. Those most vulnerable suffer most, especially Yemenis displaced by fighting or migrants trying to pass through the country seeking work in the Gulf,” said DG Swing. “Today I met with people displaced by fighting, whom IOM was only able to reach with aid a few weeks ago. They are in dire conditions virtually without basic services and this is the first time they received any help since fleeing their homes more than a year ago. So many like them are facing starvation, cholera and death. This is part of the reason for my visit; to see how we can gain more access to the communities that need our help most,” added DG Swing. “I urge all parties to the conflict to make real efforts towards finding peace because aid alone is not a solution,” DG Swing said.